- In order to begin this quest you need to complete Taking Independence and regain control of the Castle. Once you have Castle up and working again, have a nap or quick travel somewhere, then check the grounds again. There should be a militant old woman standing around. Talk to Ronnie about rejoining to trigger the quest. - Ronnie will talk about getting into the Castle’s armory. Follow her to the giant, conspicuous metal door set into the walls, then talk to Ronnie again. She’ll go wandering a second time. Follow. She’ll take you into the old general’s office. Get into Workshop mode and Scrap the heap of concrete blocking the doorway in this room. It leads down to a new area. Be ready for combat. - Start exploring with Ronnie helping out. Straight ahead and on your left is a small chamber; be careful in here, as there’s an active Frag Mine beside the pump. There’s another in the connecting room, as well, and yet another at the end of the hallway where you came in. - Take a right at the end of the hall. There’s a room here with minor Rad exposure, and on your right is a dead-end storage room filled with Cannonballs and Bags of Cement. Not worth grabbing now, but perhaps valuable later, when you have an empty inventory. Dead ahead is another small room - mind the Frag Mine - and a split in the path. Take the right, into the busted-up room, and you’ll see a Turret across the hall. Take it out. - There are two more primed Frag Mines, one in the brightly-lit hallway, the other in the small room connecting to the room with the Turret. Both connect to the same room, though you can get at a different set of shelves by going through the front, via the hallway. (Watch out for another Frag Mine in this narrow section of room. iIt’s around the corner, and really well hidden. Ow.) Go through the back and you’ll find another, adjoining room with a Fusion Core to steal, as well as a Chemistry Station. - Slip through the wall by the generator. Disarm the Frag Mine on the floor, then take a left. There’s another Frag Mine at the next left, and to the right… a big ‘ol robot named Sarge. 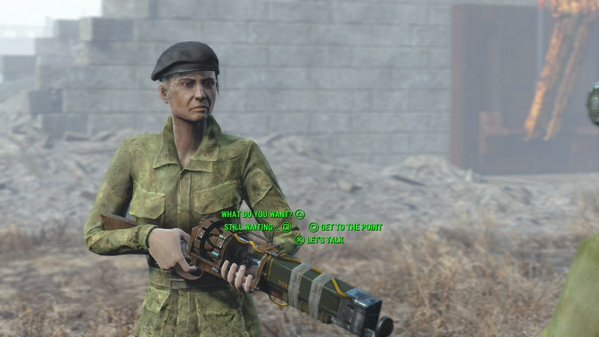 Sarge from Fallout 4. Damn fast for such a big robot. Good lord. This thing is a brutal opponent if it catches you in the open, and even characters in Power Armor are unlike to stand much of a chance unless they’re overleveled. 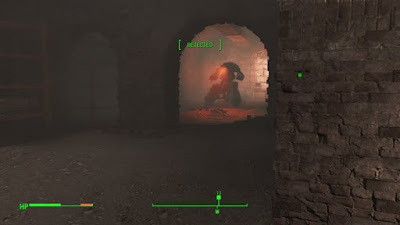 Fortunately, Fallout gives you the two tools you need to win: Ronnie and a ton of Frag Mines. Let Ronnie take point and do damage to Sarge until it decides to change its aim and come after you, then lead it through the halls, laying down Frag Mines for it to roll over and take damage. - Along with some ammo beside the beds, there’s a terminal in the room where Sarge was sitting. Use it to unlock the next room over. There’s a corpse on the floor with a lot of cool stuff (three Fusion Cells and one hundred Plasma Cartridges, as well as a complete Minutemen General’s Outfit), as well as a terminal detailing the corpse’s final days. Go through the next door when you’re done looting. - Back up to the Castle. Open up the big door nearby to find the main area again, then check to your left for the actual armory. Inside is a ton of ammo, most of it for laser-based weaponry, as well as a number of mods specifically for Laser Muskets. (Also, some spare Muskets behind the door. Sweet.) Of note is a Fat Man on the shelf, a Mini Nuke for it behind the door, and several Tesla Arcs. - Grab the Artillery Schematic from the far table and the Smoke Flares from the yellow box to the right of the table (as well as whatever else you please), then follow Ronnie back outside. Speak to her, then enter Workshop mode and choose the Special category. From here you can set up Artillery Pieces. You can put them anywhere you like, but it makes the most sense to set them on the walls, facing into the city. Agh I the terminal said "[INACCESSIBLE]" and I can't get any farther. ronnie completely left me after I scrapped the rubble. She left me too and now I can't get past the door. Did you figure it out yet? go out and come back in, its a known bug. You don't assign Ronnie. You can never assign her to anything, actually. You'll have to pick one of the other Minutemen to do it. ARRRRRRRRRRRRRRGGGG. And Ronnie keeps telling me to get the Arty Schematics and smoke grenades and won't do anything else....what the hell? This drove me crazy for a bit too. You have to be in the Workshop Mode to assign people. Choose a random Minuteman, choose Assign, then choose an Artillery to assign.